Glastry Farm Ice Cream are delighted to win a Gold Blas na hEireann Irish Food Award for our Lemon Meringue Ice Cream! 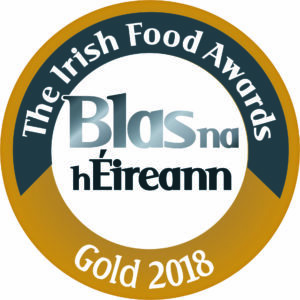 In the coastal town of Dingle in the County of Kerry, along the Wild Altantic Way, at the much anticipated finals if the Blas na hEireann Irish Food Awards Glastry Farm gained its fifth Irish Food Award in 4 years including three Gold awards. The Lemon Meringue Ice Cream was the star of the show, winning the Gold award in the best ice cream category for 2018. It could be said that Glastry Farm’s Lemon Meringue Ice Cream is the best ice cream on the Island of Ireland in 2018. What an achievement for a company based on a farm in the little townland of Glastry, County Down. There was stiff competition from many well known ice cream brands from across the island, but judges stated it was the natural flavour of the lemon based ice cream and the homemade lemon and lime curd, against the contrast of the crunchy meringue pieces that won on the day – to achieve a meringue inclusion that stays crunchy in an ice cream is technical excellence. A big thank you must go to everyone who has supported Glastry Farm over the past 11 years. The Taylor family are extremely proud to be consistently creating new and delicious flavours that their customers and friends enjoy!